With an innovative combination of a novel application of synchrotron imaging, high-resolution microtomography, and developmental analysis, the team reconstructed tooth growth and determined the age at death of a fossil juvenile from Jebel Irhoud, Morocco. This study represents the first non-destructive approach to characterize dental development with a high degree of precision, as synchrotron images reveal microscopic internal growth lines without damage to the specimen. The team found that the Moroccan fossil child showed an equivalent degree of tooth development to living human children at the same age. These findings and other evidence suggest that modern biological, behavioural, and cultural characteristics appeared relatively late in the past six million years of human evolution. Modern human origins continues to be one of the most hotly debated topics among anthropologists, and there is little consensus about where and when the first members of our species, Homo sapiens, became fully modern. While fossil evidence tells a complex tale of mosaic change during the African Stone Age, almost nothing is known about changes in human ‘life history,’ or the timing of development, reproductive scheduling, and lifespan. Tooth growth, and most importantly molar tooth eruption age, represents one of the most powerful clues to reconstruct growth processes in fossil humans. By using incremental growth lines in teeth, similar to annual rings in trees, developmental rate and time may be accurately established millions of years after death. Research during the past two decades has shown that early fossil humans (australopithecines and early Homo) possessed short growth periods, which were more similar to chimpanzees than to living humans. However, it unclear when, in and which group of fossil humans, the modern condition of a relatively long childhood arose. 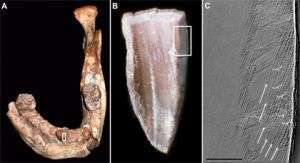 In this study, tooth growth and eruption was examined in one of the earliest representatives of Homo sapiens, found in Jebel Irhoud, Morocco and dated to approximately 160,000 years ago. The novel application of high-resolution propagation phase contrast X-ray synchrotron microtomography, developed by Paul Tafforeau during his PhD studies, permits previously inaccessible developmental features to be revealed non-destructively. Information on tooth growth in the Moroccan child was compared with other fossil and living human populations to determine if the modern condition of prolonged dental development was present. The results suggest that the Moroccan child, at almost 8 years of age, is currently the oldest member of the genus Homo to show a modern human life history profile. The team suggests that an extended period of development, and by implication childhood, may be linked to the origins of social, biological and cultural changes needed to support dependent children with greater opportunities for early childhood learning.